ESL Blog Roundup No. 2 | So, You Think You Can Teach ESL? Welcome again to another rendition of ESL Blog Roundup! I’m your host, Ketan, and let’s get ready to RUUUUMMMMBLEEEEEEE!! This first entry gives a few good tips on teaching pronunciation and shares some activities to do. The author details his DELTA course and shares some insightful tips. He mentions using TPR (Total Physical Response) with young learners, working with adults, and using cuisinaire rods. This next entry comes from a brand new ESL blog that focuses on ESL and IELTS exam training. This specific post briefly discusses what filler language for ELLs. Filler language is a linguistic form of “buffering” so to speak, when we cannot think of the words or phrase we need at the time. So, we fill that void by using words such as “ummm..”, “aahhh..”, and others. This post is less of an upbeat one, and more of a realistic slap in the face. It’s a hard pill to swallow, but not every ELL student will be successful. Some people just can’t learn a second language as easily as others (whereas they may excel in other areas such as science or maths). This post discusses three reasons why some ELLs may not succeed. This blog is full of excellent ideas for making learning English fun and engaging for students of all ages! This post focuses on using drama and role play to help teenage ELLs become more engaged in the lesson. I know it’s hard to keep teenagers focused, but using drama activities such as role plays can help kids develop speaking with greater expression and fluency, as well as build self-confidence. 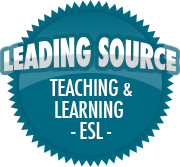 This is one of my favorite ESL blogs, mostly because it is full of excellent tips and articles. Having the OUP name, you know it will be quality content no matter what you’re reading. As more and more students have smartphones, iPads, and other devices, it’s challenging to keep kids focused in class. Technology is always changing and it is important for educators to keep up with the times in a matter of speaking. Using tech in the classroom has enormous benefits such as keeping information relevant, teaching computer skills, as well as developing a more interactive lesson between the students and teacher. This post highlights the use of smart devices and how they can improve the learning experience, but also how the need to be monitored so the learners stay on task. Well I hope that was as exciting for you as it was for me! Stay tuned next week for another roundup!